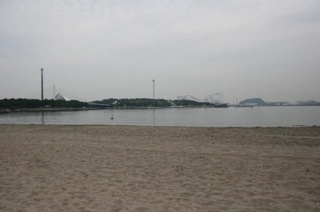 Park of Sea (海の公園) is a artificial beach park located in Yokohama. It is one of the nearest beach from Tokyo. Because it shallow, you can enjoy digging clams here. In summer many people visit here and enjoy beach spots and family activities. Also, you can enjoy fishing and wind surfing. There is parking, and restroom. 1. use Keihinkyuko Line to Kanazawa Hakkei. The Beach is abount 1km long. There is Firework festival in Summer. There are BBQ facilities, basket goals, and beach Valley spots.